Portland, September 27th, 2014. CCA’s 14th Annual Hero Gala was dubbed an evening of romp & circumstance,. The event rocked the Oregon Convention Center to the tune of $1.16 million with a star-studded crowd. More than 850 guests were entertained by the likes of The Decemberists, Patrick Lamb, Ural Thomas with Ragen Fykes and Moorea Masa, Luz Elana and Tiburones, March Fourth Marching Band, Wanderlust Circus, Sneakin’ Out, and Nu Shooz. Taylor and her Chemo Pal mentor, Alyssa Willamson, were shining bright with their beautiful face paintings. Dr. Janice Olson, MD, MHA, Medical Director, Children’s Cancer and Blood Disorders Program, Randall Children’s Hospital at Legacy Emanuel, Regina Ellis, CCA Founder and CEO, and CCA Board Member, Andrea Corradini, Senior Merchandising Director, Emerging Markets Running, Nike, Inc., get into the spirit of the playful night. Former Portland Trail Blazer, Terry Porter, Suzie Porter, CCA Board Chair, Andy Lytle, and Mary Lytle. Nike’s Tinker Hatfield, Vice President, Design & Special Projects, and CCA Chemo Pal mentor and longtime supporter, David Brown, Merchandise Director, NIKE Inc. The Wanderlust Circus entertained Gala goers throughout the entire Wonderball. 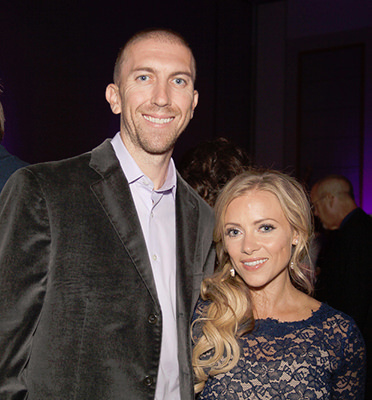 Portland Trail Blazer, Steve Blake, and his wife, Kristen, longtime supporters of CCA. Artist Rochelle Carr with CCA Ambassador Board Member, Bryce Amato, posing in front of Rochelle’s wall of cheerful and thoughtful artwork. Regina Ellis, CCA Founder and CEO, with Chris Funk, from The Decemberists and Black Prairie. Paul Gulick, CCA Board Chair Emeritus, Co-Founder, In-Focus, Founder, Clarity Visual Systems, and Michelle Decourcy of Michelle Decourcy Collection. 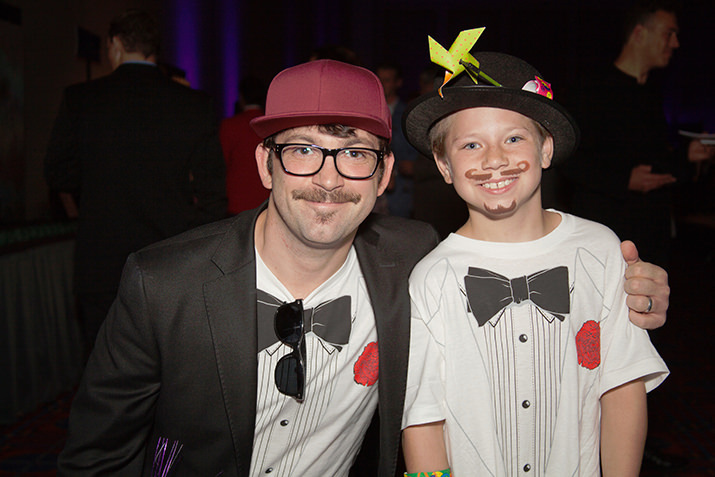 Chemo Pal mentor, George Mollas and his mentee, Nicholas, celebrating the occasion in style. Members of The Decemberists, Patrick Lamb, Ural Thomas with Ragen Fykes and Moorea Masa, Luz Elana and Tiburones, March Fourth Marching Band, Wanderlust Circus, Sneakin’ Out, and Nu Shooz goofing off during rehearsal for the Wonderball. 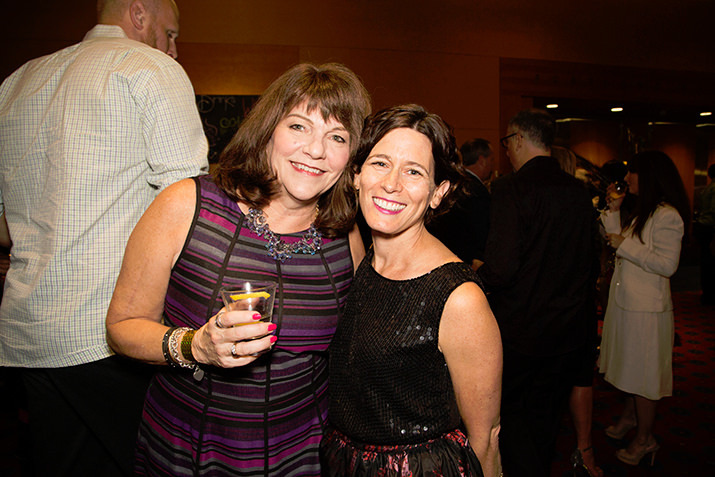 CCA Founder’s Society member, Marsha Brockmeyer, celebrates with CCA VP Brand, Abby Guyer. The sign says it all 14th Annual CCA Hero Gala: Wonderball! Opus Events Agency CEO and CCA Board Member, Grant Hammersley, with CCA Board Member Tim Cooper, Senior Vice President, Brown & Brown Northwest. The Decemberists front man, Colin Meloy, serenades Wonderball guests with the help of bandmates, Jenny Conlee and Chris Funk (not pictured), and the March 4th Marching Band. Jennifer and Jeff Nyburg, Wonderball Presenting Sponsors Angela and CS Sheffield, and Wesley Sheffield. 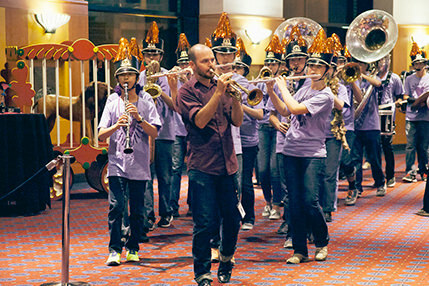 Jordan Roquemore, Beaverton High School Marching Tech, leads members of the Beaverton Marching Ensemble, in a rousing rendition of “When the Saints Go Marching In” to transition revelers to the Portland Ballroom for the evening’s program. CCA Board Member, Andrea Corradini, Senior Merchandising Director, Emerging Markets Running, Nike, Inc., and Cholee Thompson, Owner and President, Ryan Artists, share a ballerina/fairy bonding moment. “We invited our best friends to “come out and play with CCA” and that they did. We are blown away by their generosity and so grateful they stand united with us in the belief that JOY MATTERS for seriously ill kids, teens, and their families.” said Regina Ellis, Founder and CEO of CCA. It’s actually Chris Funk, multi-instrumentalist from The Decemberists and Black Prairie. Thanks for the correction. It’s the info CCA gave us, but we’er always happy to update.